The narrow view of Eugen d’Albert as a piano virtuoso and the composer of the verismo opera Tiefland, though widespread, is as revealing of our own day as it is inadequate to his rich oeuvre and multi-layered personality. Born in Glasgow, he could point to Italian, French, and English ancestry, possessed English nationality until 1914, and eventually became a citizen of Switzerland. But he felt strong ties to Germany, set only German texts, and preferred the German form of his first name. After receiving music lessons from his father, d’Albert entered the New Music School in London at the age of ten. There he became a piano pupil of Ernst Pauer, who was highly impressed by the boy’s pianistic skills. In 1881 he made the acquaintance of Franz Liszt, with whom he perfected his playing in Weimar. He then undertook a great many concert tours, gaining a reputation for his performances of Bach and Beethoven. His earliest published compositions appeared in 1883. Although historians often emphasize the verismo style of his operas, symbolist and early expressionist elements are no less important. Always staying abreast of the times, he produced a protean compositional output that still awaits rediscovery. He married six times; among his wives were the mezzo-soprano Hermine Finck and the pianist-composer Teresa Carreño. Though unprovable in the absence of serious d’Albert scholarship, the Overture to Franz Grillparzer’s “Esther;” op. 8 (1888) is said to be his fourth orchestral composition following a lost piano concerto in A major, his B-minor Piano Concerto, op. 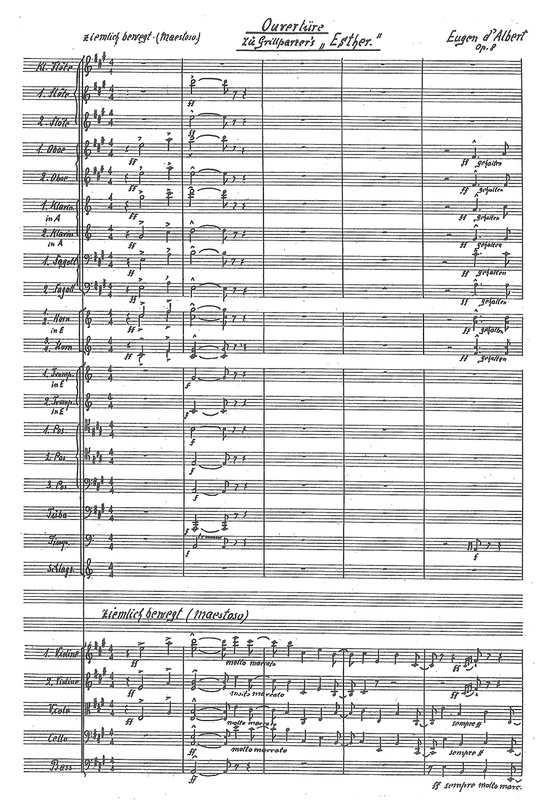 2 (1884, premièred by Hans Richter), and the F-major Symphony, op. 4 (1886). Grillparzer’s evocative dramatic fragment Esther, written in 1848 and published in 1861, is based on the biblical Book of Esther (known today in music primarily through Handel’s like-named oratorio), in which Esther, the new queen at the side of King Ahasuerus (Xerxes), defends the rights of her own Jewish people against a planned political intrigue. Since Grillparzer’s drama, with its uncommonly tight diction, remained unfinished, Albert’s op. 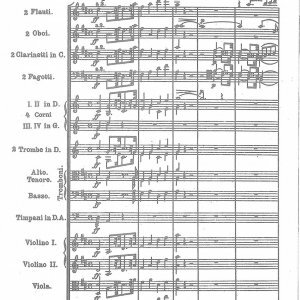 8 may be regarded as a character overture lying stylistically between Schumann, Wagner, and Parry (the English admixture in the piece is an interesting peculiarity). Though the overture was rediscovered by the recording industry in 2003, it still awaits revival in the concert halls of Germany and Austria, just as Grillparzer awaits his in the theater. For performance material please contact Boosey & Hawkes, Berlin.